Miso Crafty Knits: A Surprise in the Mail!! I got the most wonderful surprise in the post this morning!! Nothing beats getting something unexpected in the mail to brighten and lovely up an otherwise gloomy and rainy day!! Anyways, I keep glancing at the magazine on my left...it's dying to be read. Well, I don't know Japanese, so it's dying to be looked at and admired. 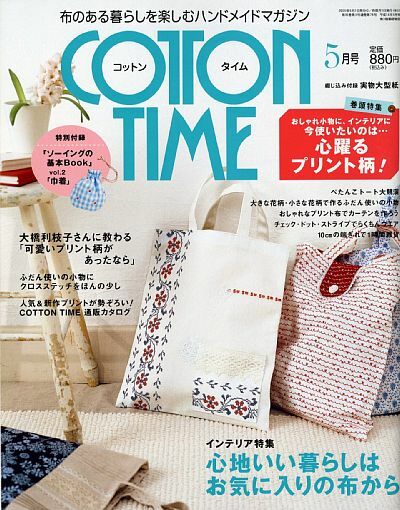 Cotton Time calls!! Must jet! No problem! I will look for more next time I'm at Sophia Books. When I was there last it was the only one left! I totally forgot about Sophia Books! I thought they closed down though. I guess not! They had Cotton Friend as well- Does that one interest you? It looks more like clothing patterns though. I've heard of Cotton Friend, but have never thumbed through an issue. I've seen a few on eBay, but those issues were mainly about handmade dolls and laundry baskets. I've seen a few issues that were about clothes, but the website mainly showed the pages that had kids clothes. I guess it all depends on the issue and whether or not if it's clothes that I would be interested in or can get inspired from...I have no interest in making Ragedy Ann type dolls...if you know what I mean.